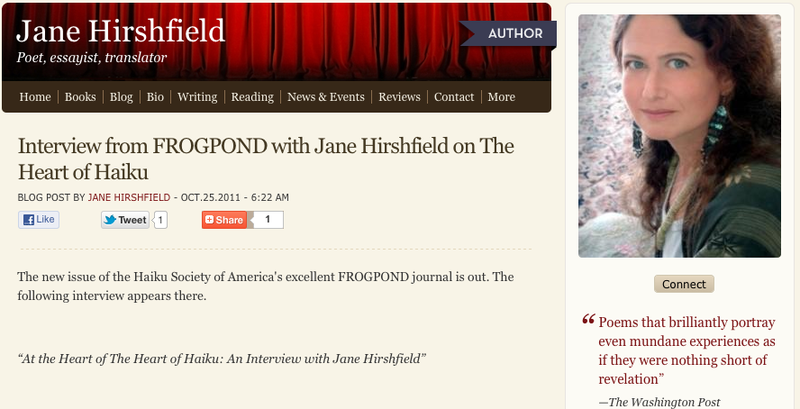 The new issue of the Haiku Society of America’s excellent FROGPOND journal is out. The following interview appears there. This interview was conducted by email in August, 2011. CE: Thank you, Jane, for agreeing to this interview. I think your Kindle Single, The Heart of Haiku, will be of interest to many haiku poets, as will your comments about this essay. You have a long history of printed publications, and you have described yourself previously as someone who is not especially comfortable with computer technology. What prompted you to circulate The Heart of Haiku as a Kindle Single? JANE: Thank you—I appreciate the chance to talk about this with what I see as this piece’s most natural audience, the haiku community. Bringing this piece out as a Kindle Single was an experiment—I had never read an e-book myself before this came out. I have to admit, I don’t really like reading on-screen. But many others do, and mostly I did this because the description for the Single program fit exactly what I had: an essay-lecture too long for publication in any magazine, but not long enough for a formal printed book. I had thought about expanding it into a regular book—but I’d have needed to polish many more of the new translations I’d done (with the invaluable help of Mariko Aratani, my co-translator for the classical-era tanka poets in The Ink Dark Moon), and I’d also have needed to round the book more fully. I do now wish I had put some back matter into even this Single—a “further resources” section, for instance. But I never could quite decide to expand it, the piece stayed on my desk, and when the suggestion to submit this to the new Kindle Singles program came up, I took it almost on impulse. I didn’t actually expect them to accept it—it’s by far the most literary thing on their list so far. And then from acceptance to publication was dizzyingly fast—two weeks, including their copyediting, which was, by the way, very good. So I didn’t have any time for anything but the quickest final pass. You know, Basho himself might have been one of the first to buy an iPad or Kindle. He was never without the books of earlier Chinese and Japanese poets he loved, and I imagine would have been happy to carry less weight in his knapsack. He was, throughout his life, both practical and what’s now called “an early adopter”—haiku anthologies were the first broadly popular printed books in Japan, so Basho, who published in them and also brought one out himself, was participating in the leading-edge technology of his time. One thing I muse over in The Heart of Haiku is that Basho, today, might have been the first person to take You Tube videos and turn them into a true art form. What he did feels comparable to that, to me. There are so many superb books on Basho already, I’m not sure the world needs another. That was always one of my hesitations about turning this into a book. I do retain all the rights, and will quite likely include this in my next book of essays. That way it will reach more people who don’t already know about haiku—which is what I first wrote it to do. And the Kindle Single did do that—a truly startling number of people have bought it so far, in only two months. I’m sure it helps that it costs only 99 cents, and can be downloaded onto any computer almost instantly. I hope some of them may continue to pursue that curiosity further. CE: I understand that this project began as a presentation for the 2007 Branching Out series of poetry lectures held in public libraries around the country, a program co-sponsored by the Poetry Society of America and Poets’ House. How would you characterize your initial audience? How much did you revise the presentation before it was published by Amazon? For instance, to what extent was this project originally conceived of as a way to help people better understand and appreciate haiku as readers or as casual writers of haiku-like poems? Do you feel that the current version is at least as much directed toward those who already write haiku as it is toward the initial audience? I was asked by the Branching Out program to give a talk for the general public—for people who might not have read much poetry, let alone haiku. I tried to do that—to find ways to open the field to newcomers—but poetry is a universal language, whose very point is that it does not simplify; it expands, saturates, investigates, faces many directions at once. I tried to make the original talk something that would be interesting to both kinds of audience—new, and informed—and truly, there isn’t that much of a gap. You’re always a beginner, entering a poem. A poem asks an original, unjaded presence, some state that includes both informed awareness and the erasure of preconception. I have polished the piece quite a lot since the original lecture, but that’s just what I do with anything I write, poetry or prose. I’d gone over it again just this past February, when I was asked to lecture on Basho at a Japanese university. As to whether I changed it to make it more useful for serious writers of haiku, no, not specifically. I myself don’t make that strong a distinction between looking at poetry as a writer and as a reader. Every serious writer needs also to read alertly, with a real depth of attention—both her or his own work, and the work of others; and every act of reading a poem is a recreation of the original energies of its writing—that is what a poem is: not a record of thought, experience, emotion, realization, but a recipe for its own reenactment. CE: You have extensive knowledge about poetry in general and haiku in particular, including a knowledge of the history of haiku in English. Where do you see this book fitting in among some of the other work on haiku in English (for instance, Eric Amann’s The Wordless Poem; R. H. Blyth’s Haiku in 4 volumes; Harold G. Henderson’s Haiku in English; and William J. Higginson and Penny Harter’s The Haiku Handbook to name just a few foundational texts in this field)? And where do you see this essay fitting in among other considerations specifically focused on Basho’s life and work (Robert Aiken’s A Zen Wave; Haruo Shirane’s Traces of Dreams; Makoto Ueda’s Basho and His Interpreters come to mind among others)? Those books are indispensable, and many were part of my own introduction to haiku and, I’ll add, to poetry as a whole: the first book of any kind I ever bought for myself, at age eight, was a Peter Pauper Press book of translated Japanese haiku. We should add also the many translations of Basho’s poetry now in print. I recommend them all—I think that to understand anything, especially when there are large leaps of culture and time and translation involved, the most accurate understanding comes from looking at multiple sources. There is no single “best” authority. If you can’t read Basho, Issa, Buson, or Yosano Akiko in the original, then reading them through many eyes is best. As for how my contribution fits in, The Heart of Haiku was retitled by Amazon when they took it for the Kindle Singles program; my title was Seeing Through Words: Matsuo Basho, an Introduction. I think that tells you quite a lot about how I see this piece: I would never myself have made such a grand claim for it as “The Heart of Haiku” does. My piece is introductory, not exhaustive, and its angle of entrance is historical, through Basho, not haiku in general, though to read Basho you have to understand what haiku are, and how they work, and what they can hold at their best. Basho himself, though, is a perennially useful lens, since haiku as we now know it was so radically changed by Basho, generally described as its “founder,” even though the form existed before him. For current, American writers of haiku, The Heart of Haiku is really a way to look back to the rootstock, to refresh their relationship with how haiku was first conceived by its extraordinarily radical and continually evolving founding figure. Basho himself was concerned with so many of the issues that current haiku writers are concerned with—how to write in this moment’s language and perception, how to learn from the past without being bound by it, how to use haiku as a tool not only for expression but for the navigation of a life. I still read Sappho and Homer, I still read Su Tung Po and Dante, and I still read Basho and Issa and Buson. These are wellspring poets for me. Basho’s teachings about writing are as relevant and provocative now as they were when he was alive. “Poetry is a fan in winter, a fireplace in summer.” “To learn of the pine, go to the pine.” “Don’t imitate me, like the second half of a melon.” His navigation of the creative life and poverty, his restless curiosity, his losses, even his death was exemplary, really—Basho’s last spoken words take the point of view of the flies his students were trying to chase from the room. They show how supple and compassionate a poet’s sense of existence can be. CE: The Ink Dark Moon, it’s been said, helped inspire what’s become a working community of tanka writers, both in the U.S. and in Australia. How do you see your role here, as a poet, translator, and teacher? JANE: I might not have published this Basho piece at all, except that people who’d heard it or read it in manuscript kept telling me both that they loved the translations and that it does bring something new to the table. That it was helpful. That’s my hope for anything I do, though I write my own poems outside of any hope, or intention, beyond the needs of that particular poem and moment. I translated Basho’s haiku freshly mostly because I found I couldn’t use other people’s translations for the original talk—not because they weren’t good, just because, once you’ve done some translating, you understand how much more intimate an entrance to a poem that is. I am tremendously lucky that my old co-translator, Mariko Aratani, agreed to re-join me for this project. As a teacher of poems, I’ve been investigating the deep workings of poetry for almost forty years now, both Japanese and Western. I believe in the happy accidents of cross-fertilization and that different traditions have always informed one another. There are two essays in Nine Gates: Entering the Mind of Poetry that talk about Japanese poetics and translation. My interest is always the same: in how poems work, precisely, in why they affect us they do, and in bringing in whatever background helps us read more vulnerably, openly, accurately, and deeply. I think this is especially needed for haiku. We teach haiku to third graders, but in fact it’s an art form that requires some real initiation to be truly practiced or read. Haiku are the most immediate of art forms in one way, but in another, they are slip knots that you need to know the knack of, to untie fully.The more I learn about haiku, the more I feel how much I have not yet learned. It is bottomless, really. Any good poetry is. CE: In your essay, you address the wide popular interest in non-literary haiku and you specifically reference the thousands of haiku written about Spam (“Spamku”) and posted online. You foreground that, “… to write or read with only this understanding is to go back to what haiku was before Basho transformed it: ‘playful verse’ is the word’s literal meaning. Basho asked for more: to make of this brief, buoyant verse-tool the kinds of emotional, psychological and spiritual discoveries that he experienced in the work of earlier poets. He wanted to renovate human vision by putting what he saw into a bare handful of mostly ordinary words, and he wanted to renovate language by what he asked it to see.” To what extent do you find contemporary English-language haiku poets continuing to follow this approach? It seems to me that the best contemporary haiku writers are in Basho’s lineage, and Issa’s and Buson’s. This is of course my own definition of “best.” It’s fine that many poets do other things as well. But the central work of poetry is the same everywhere—from Sappho to Akhmatova, Tu Fu to Frank O’Hara, lyric poets magnify and enlarge and open our relationship to our lives, to the lives of others, and to the world. Your consideration of Basho’s overall output of haiku leads to an intriguing claim about the impact transparent seeing can have. You state, “Basho’s haiku, taken as a whole, conduct an extended investigation into how much can be said and known by image. When the space between poet and object disappears, Basho taught, the object itself can begin to be fully perceived. Through this transparent seeing, our own existence is made much larger.” Would you please elaborate on how this type of seeing enlarges our existence? I’ve come to feel that every good poem does this, not only haiku. The exchange currency of the imagination is fundamentally transformative and empathic. The current thinking in neuroscience is that this recreation of other within self has something to do with mirror neurons, but poets have known the alchemies of empathy from the beginning. Permeability is how image works, how metaphor works. Every time we take in an image in a poem, we become for an instant that image. Reading “mountain,” I become for that moment everything I know of mountainness—its steepness, its insects, its largeness, its seeming immobility punctuated by streams or rockslide, what it asks of the legs that travel it, what it asks of the breathing, of the eyes, what it tells us of abidingness and perspective, of distance and scale. Any time we take in a poem’s held experience, we become that experience. The experience of a poem is not “about” life—it is life. And so taking in a good poem, our lives are expanded by that poem’s measure. One of the great paradoxes of haiku is that the measure of taken-in meaning can be so large, from a vessel so small, and how meaning in haiku can reach in almost any direction. A haiku can puncture our human hubris, or can remind us that we too are going to die. It can pierce us with the beauty of spareness or open us to the futility of ambition. It can evoke humor, memory, grief. It can, at times, do all these things at once. CE: You also note that “…the haiku presents its author as a person outside any sense of the personal self.” Do you see contemporary English-language haiku presenting the authors as people outside a sense of the personal self? What might the author gain from striving to experience and write haiku in this manner? JANE: I recently judged a haiku competition and was a bit startled by the frequency of the pronoun “I” in one form or the other, and by the strong presence of personal life that was in them, including in those I chose as the winners. In some cases, I wondered if the pronoun might have been there to fill in the count, since these were haiku written in the traditional 5-7-5. But I think it runs deeper, and is more a reflection of how poetry in general is written in America today. Basho studied both Taoism and Zen, and his relationship to poetry reflected that. Basho once said that the problem with most haiku was that they were either subjective or objective. A student asked him, “Don’t you mean too subjective or objective?” Basho answered, simply “No.” I share Basho’s Zen training and interests, and I see poetry as, in part, a mode of perception by which we can slip the shackles of single view and single stance. I think that is one of poetry’s tasks in our lives, to liberate us from narrow, overly pointed seeing. A good poem never says or holds only one thing. This opening into broader ways of perceiving does happen in poems that include “I” and personal circumstance, I should add. And on the other side, I think it a misconception to believe that all haiku ae somehow supposed to be “objective,” and impersonal. Poetry reflects inner experience and understanding. The most objective haiku I can think of is Buson’s: “Spring rain,/ the belly of the frog/ is not wet.” This is not a metaphor for anything other than what it holds, the awareness of rain so gentle that it does not drip down to or splash up to even something so near as the frog’s belly. And yet, reading that haiku, I feel it, in body and in spirit; I feel appreciation for the action of the small and the subtle, for the wetness of the frog’s back and the grass tips’ thirst. To have such an experience is to step outside of ego, but not outside our experience of life on this earth, a life with rain, shared with other creatures. And this modest, homely, silent frog is something that emerged into Japanese poetry with haiku—in earlier Japanese poems, we know frogs by their voices, not by their skin’s dryness or wetness. Frogs’ calling is an image of our own longing, desire, and courtship, of the small sounds we ourselves make amid the vast dark. Buson’s silent frog, or Basho’s in his famous “Old pond,/ frog jumps in/ the sound of water,” these are different. Frog is frog, water is water, the sound of their meeting is completely itself, part and whole neither vanish nor are separate. This seems to me something worth noticing, worth storing in repeatable words, worth practicing. Isolation is real, the solitude of the self is real, but interconnection is equally real. A good haiku keeps us in the particular and multiple, not the generic. It stops us from leaning too far in any direction. Thank you again, Jane, for participating in this interview and providing additional insights into your essay, The Heart of Haiku. 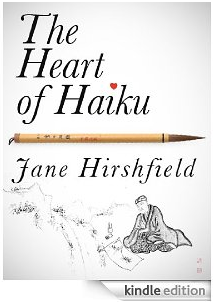 NOTE: Jane Hirshfield’s The Heart of Haiku is available from Amazon.com as a $.99 Kindle Single, and can be read on any computer or smart phone, not only Kindles, with a free download. A new book of poetry, Come, Thief, has also just been published, by Knopf. Also see A Haiku on The Heart of Haiku; the excellent Poetry Foundation biography on Jane Hirshfield, including poems, articles and more; Pirene’s Fountain: Jane Hirshfield on Poetic Craft; and What Rainer Maria Rilke inscribed on the copy of The Duino Elegies he gave his Polish translator. This entry was posted on December 15, 2011 at 7:51 am and is filed under Articles, Poetry, Writing. You can follow any responses to this entry through the RSS 2.0 feed. You can leave a response, or trackback from your own site.